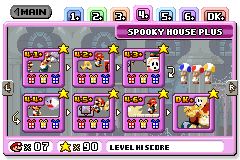 Spooky House Plus is the fourth plus world in Mario vs. Donkey Kong, being the plus world of the earlier Spooky House world. 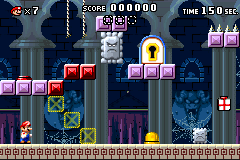 Level 4-1+ A level with Thwomps and Color Switches. 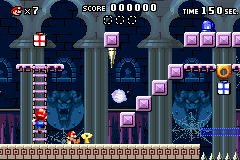 Level 4-2+ A level with many Color Switches and platforms. 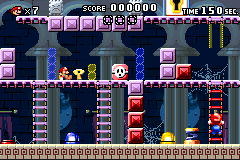 Level 4-3+ A level with Polterguys and Spike Traps. 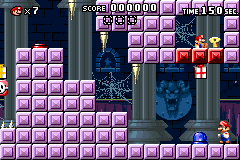 Level 4-4+ A level with a Boo. 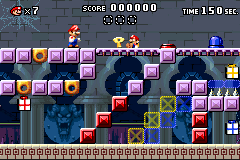 Level 4-5+ A level with a Color Switch puzzle and Thwimps. 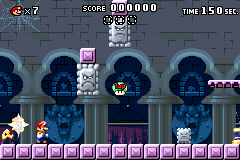 Level 4-6+ A level with Color Switches, Thwomps, a Thwimp, and a Polterguy. 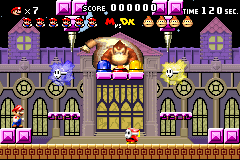 Level 4-DK+ The eleventh fight against Donkey Kong. This page was last edited on February 17, 2019, at 02:48.